Happy Friday to you all! I hope you have had a good week. I’ve had a lovely week 🙂 It was my birthday on Tuesday and my daughter’s on Wednesday and of course there was Mother’s Day last Sunday! I’m pleased to report that I have been very spoilt – and why not?!! Lol!! Anyway, today I’m sharing some inspiration with this cute little character called Lili Pad Frog which is available at Scrap n’ Dipity. This was a new release from last week – but if you head on over there you’ll find some more fun images that have been released today 🙂 While you’re there why not check out the Challenge Blog? You have until the 14th of March to link up and this month our theme is ‘Anything Goes’. There is a FREE image called Creeper Bear that you can use to take part – however you don’t have to use a Scrap n’ Dipity image to take part. Rules for the challenge are HERE. I also used DP from American Crafts – Dear Lizzy ‘Neapolitan’, blue cardstock – American Crafts, WRMK Corner Chomper, My Favorite Things – cloud dies, Glossy Accents, Spectrum Noirs and a Frantic Stamper stitched edging die. The sentiment is computer generated. Belated Happy Birthday, Karen! Glad to hear you were spoiled! 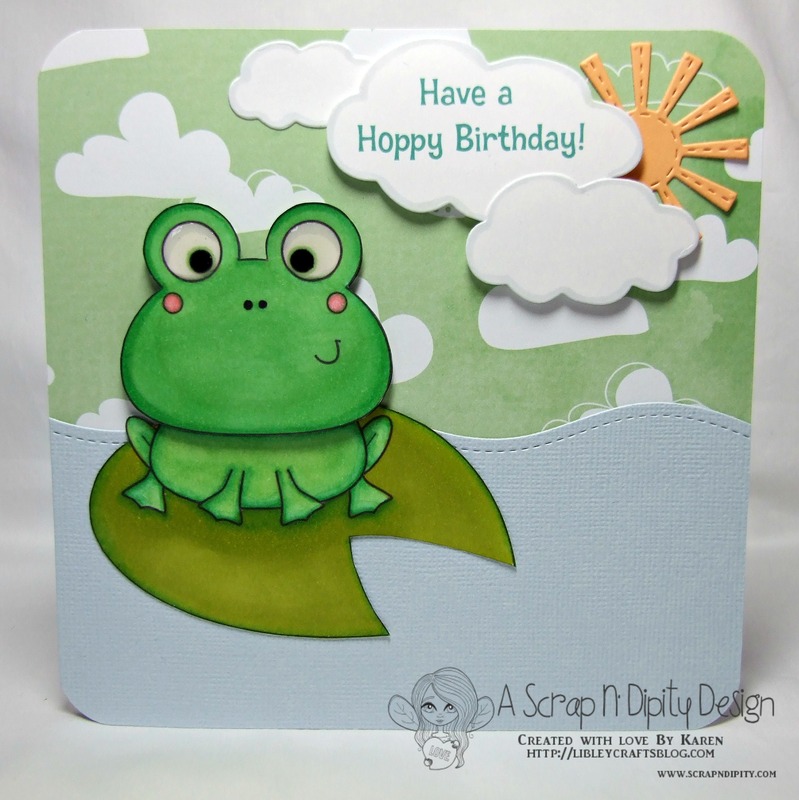 What a CUTE frog on the lily pad…great card! And, happy late birthday to you and your daughter!!! Cute card Karen – I like the water feel you created with that border die!! Thanks so much Jo – and I couldn’t agree with you more hehe!!! Frogs, how cute they are! This one is no exception. And I like the design of it, the type that works for men and woman, younger or older. Fun scene too, clever use of DP, paper and dies!